The Alexis service portfolio for Jehovah’s Witnesses is a conveniently sized organizer that is large enough to handle the entirety of an individual’s service materials, yet small enough to be easily transported from one service location to the next. 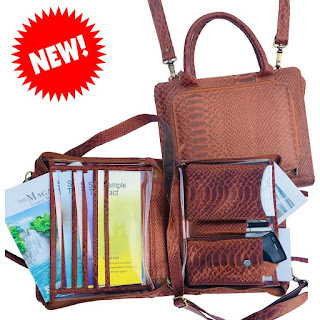 Made of durable leather in a number of colors and patterns, the organizer features specially designed pockets for service literature, a magazine compartment large enough for 10 to 15 magazines, a pen holder and cell phone pocket, and a versatile front compartment. The Alexis service portfolio weighs 2.14 pounds and can be worn with a strap length ranging from 16 to 28.5 inches. Color options include ruby, teal, latte, and caramel. For more information about the organizer and many other service items, please visit www.ministryideaz.com. Established in 2003, Ministry Ideaz is a small family owned and operated company providing an array of handcrafted items for our ministry.